Enterprise accounts can automatically translate all empty language translation fields in the tool. When this feature is used, any fields that do not have custom translations applied will be populated with a Google translation, which can then be edited by the Administrator. From the drop-down menu, select Setup >> Language Translations. Add your new language to the project. Instructions here. 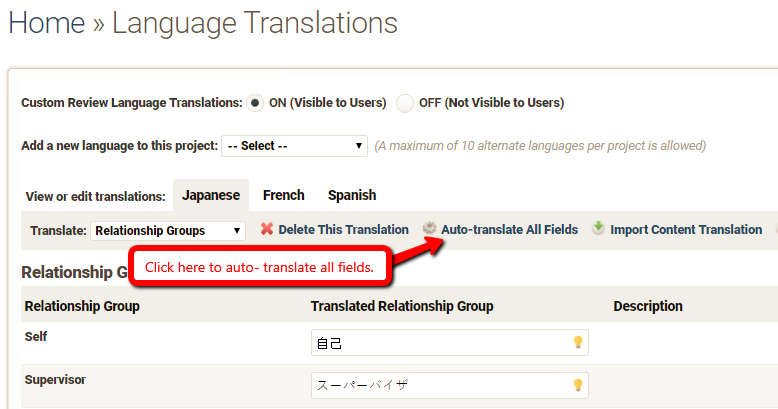 If any fields are blank once custom translations are applied, click "Auto- translate All Fields" to apply Google translations to the empty fields. Edit any auto- translated content, if desired. Select a new language to add to your project from the drop- down menu. An Excel file is then created for you to download. Any edits can be made by an Administrator in the Excel file. 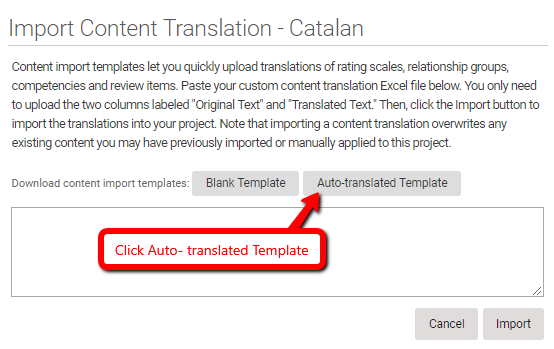 Paste your custom content translation Excel file into the text box. You only need to upload the two columns labeled "Original Text" and "Translated Text." Then, click the Import button to import the translations into your project. NOTE: Importing a content translation overwrites any existing content you may have previously imported or manually applied to this project.